Pease Lane will be opened as needed for events at Pease Auditorium. Visitor and accessible parking on Pease Lane will not be available. To accommodate this change, visitor and accessible parking will be available in Parking Lot 5, located behind Central High. Access to this lot is available from Kings Drive. See the Central Campus Map. The small parking lot on the side of Terrell will be closed. The sidewalk along Pease Lane will remain open during construction. Please note that some staff and faculty offices will remain in Terrell until the end of November. Employees can access Terrell from the Quad entrance. In the space not being used in Terrell, the removal of furniture and equipment will begin. Once all staff, faculty, furniture and equipment have been removed from the building, the physical building demolition process will begin. In addition to the changes happening on the Quad, structural demolition of the Ceramics and Visual Arts Annexes, located behind Central High, will begin next week. Construction trucks will be on site, hauling debris such as walls, floors and roof materials from the buildings. Construction vehicles will use Pease Lane to access Sam Ryburn Walk. Our apologies for the many disruptions taking place on campus; however, this is an exciting time at Central Piedmont as the college builds important new facilities to enhance student success! As part of the large-scale project to construct a new library and student life center on Central Campus, demolition work will begin along Pease Lane on Monday, Oct. 15. The Visual Arts and Ceramics annexes, attached to the rear of Central High, will be torn down. 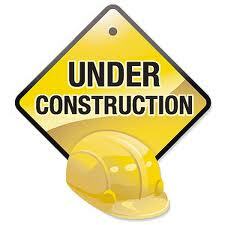 The work area will be fenced off on or near Oct. 15. The fenced off area will include some parking spaces adjacent to the Visual Arts and Ceramics annexes, plus some ramps and stairs to Pease Lane. 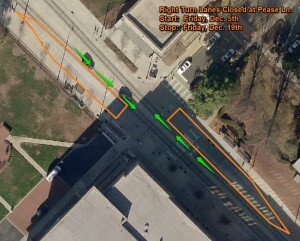 The Pease Lane sidewalk that runs next to Central High will be closed; however, the sidewalk on the other side of Pease Lane will remain open. Pease Lane itself will remain open most of the time during the demolition work. It will close for temporary periods to allow large trucks to haul away demolition debris. Facilities Services will try to give the campus community advanced notice of when Pease Lane will be closed. We thank you for your patience and understanding as the college moves forward with this exciting and important construction project. Please be alert of ongoing street work connected to the Gold Line Trolley Car project. From Dec. 5 to at least Dec. 19, the right lane of Elizabeth Avenue, in both directions, will be closed at Pease Lane and the Overcash Building. Be aware this street work will likely slow traffic and make turning onto Pease Lane from Elizabeth Avenue more difficult. If possible, students and employees driving vehicles should consider alternate routes. If you do drive through this area, please take special care to watch for pedestrians.